Asai Mang Piyambanna, latest film by Udayakanta Warnasuriya with Pooja Umashanker is being shown in the EAP Circuit. While Pooja plays the main lead role, Roshan Ranawana and Sanath Gunatilaka play the lead male roles. The film has been produced by Dhammika Siriwardana on behalf of Alankulama films. The story revolves around a village girl (Pooja) in a hill country, Ranmali who is the daughter of a traditional dancer. Praveen, a rich lad from the metropolitan comes to the scene when his rich parents visit the village in search of a picturesque location for a hotel. Meanwhile, Praveen falls in love with Ranmali which ends with the failure of the hotel project. The story takes a turn with Ranmali breaking up her affair with Praveen and leaves for the city to join a dancing troupe managed by a multi-millionaire Sapumal Senadeera. Ranmali acquires city-mannerism and changes her name to 'Malisha' to suit the adapted environment. She becomes the number the best female-singer in the country. Though Praveen tries to tie up again with Malisha, the attempts fail due to Malisha's opposition. Though the film is not for the serious audience, it provides passing entertainment with breath-taking scenery and Pooja's all-round best acting as in the 'Anjelika'. Most of the scenery, particular the first scene is some what carrying the characteristic of 'Anjelika'. It is doubtful whether the director is influenced by Channa Perera's Anjelika. Shiran de Sylva and Roshan Ranweera, though d,buts, play their roles convincingly. It should be stated here that they have a long way to go to reach the pinnacle of maturity. Sri Lankan audience may appreciate Director Udayakantha Warnasuriya if he tries to produce a film of the calibre of 'Randiya Dahara'. The film is ideal for care-free teenagers who could enjoy it as they enjoy a bar of chocolate. Even as a commercial, Asai Mang Piyambanna is devoid of an iota of seriousness which could have been possible if the Director would have though of that aspect which could give the film a much-needed credibility. Instead of pursuing the traditional formula of a triangular love story, the film could have been a better experience if the script had been better. Udayakanta should strive hard to improve his skills in the craft instead of churning out cheap fantasies aimed at seemingly, lowering the public taste. The sole motive of a venture of this nature seems to be financial rather than artistic. Director, markedly, failed to derive the best of out the otherwise talented cast. It is a pity that the Director could not make use of actors such as Sanath Gunatilaka as done by Sumithra Peiris in 'Viragaya'. After the immense success of Elizabeth Moir School's musical productions, of Street Beat (2004), Bring It On (2005) and Dazzle (2006), the school is to wow audiences again this November with the explosive Breakin' Bars. Directed by Nathan Imboden and produced by Zara Mathew under the watchful eye of accomplished veteran Aida Mansoor, the production will yet again showcase the school's well known talent and enthusiasm for performing and entertaining. Set in the climate of a Juvenile prison, where tensions runs high not only between guards and prisoners but also between prisoners themselves, we are introduced to a world where violence reigns supreme. The inmates, some barely teenagers, are dominated by the ruthless and oppressive control of the guards, led by Tanisha Panditaratne and Alexander Vogt. A recently jailed inmate, played by Nathan Imboden, is fed up of the constant abuse from the guards and arouses a unified uprising against them. The prisoners ultimately come to realise that in order to stop their maltreatment once and for all, they must put aside their differences to face the guards as one powerful force. This fantastic battle of wills is expressed in the form of dance; stomping, break dancing and heavy hip hop, song; contemporary mainstream songs, classic Broadway musicals and retro. The choreography, inspired and influenced by distinguished dancer Natasha Jayasuriya, was done in most part by the students led by Zara Mathew, though assistance was provided by professional Maldivian choreographer Nuha Naseer. From flips and shoulder-spins to free styling with hip hop routines, expect something quite unlike anything you have seen before. Through the varying dance styles, the harsh lifestyle of prisoners, their resentment of oppression and final revolution is effectively portrayed. Songs sung by their talented soloists include 'Shackles' by Mary sung by Melanie Daetwyler and Mariam Luthufi, current finalist of TNL Onstage, will be performing, amongst others, Aretha Franklin's 'Chain of Fools'. The students will perform 'Breakin' Bars', an original mixture of rap, beat-boxing and singing. Drama lovers will have another opportunity to enjoy theatre from Mumbai when the Rotary Club of Colombo East presents Ashvin Gidwani's play "Mad About Money" featuring Mumbai's renowned theatre and television personalities Amar Talwar, Jayati Bhati, Smita Bansal, Gaurav Sharma and Kavita Rathod. The play a dinner theatre one will be held at the Cinnamon Grand on November 14 (dinner theatre) and on November 15 (theatre with heavy snacks). The Principal Sponsor for the event is ICICI Bank Salary Account with Sunday Observer and Daily News the print media sponsors. Rated as 'one of India's best and most serious contemporary playwrights writing in English' by the International Herald Tribune, Mad About Money is Mahesh Dattani debut into the Mumbai theatre arena. 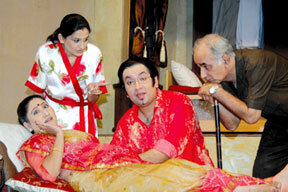 Dattani teams up with Ashvin Gidwani to produce this play on a contemporary Indian topic. It is all about human relationships in this life and the after life. The story revolves around the Mehta family and how Hasmukkbhai tries to control the entire family even from his grave...the result being some hilarious situations and outcomes. "I was extremely enthusiastic about my directional debut in Mumbai. This was a thrilling experience as in spite of having a busy schedule with the television, the cast was passionate to be a part of the play. The effort put in by the cast is tremendous and the play will reveal them. I have thoroughly enjoyed our experience in Singapore, Malaysia and Dubai and I'm looking forward to our play being well received in Sri Lanka, which I understand, has a buoyant, theatre going crowd" comments Mahesh Dattani.